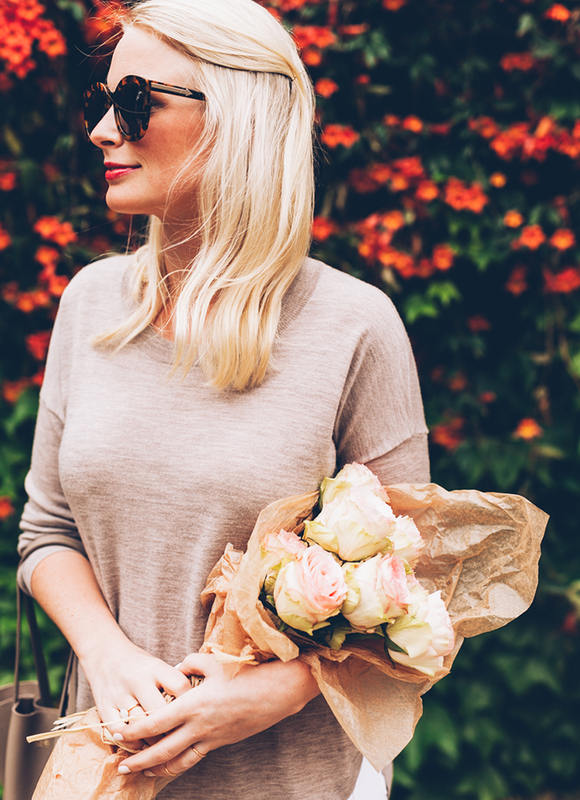 One of my favorite things about going grocery shopping is picking up fresh flowers – anyone else? I typically go to Central Market to get all my produce for the week and end up taking home a couple dozen blooms to display around the house. Last week I snagged a particularly gorgeous bouquet of roses. The outer edges were tinged green, fading into a subtle, pale pink on the inside. These blooms lasted 8 days. I kid you not. I’ve never had fresh-cut flowers last that long. Maybe I’m just super talented at killing plants (I do NOT have a green thumb!) or I never pick the best ones when I go to the store, but I was very impressed with this set. Speaking of grocery shopping… While Mara has been here this week, we’ve obviously done our fair share of hitting up yummy restaurants, but we also stayed in one night so we could both get some blog work done and eat healthy before the weekend. I cooked up one of my favorite recipes of late, cauliflower “pasta”. I cook it at least twice a week these days and it seriously is so delicious. I even made it for Easter for my family to try and my step brothers and stepdad all loved it! If those picky eaters like it, I know you will! First, chop up a head or two of (rinsed off) cauliflower. Throw it in a big bowl and toss it with some olive oil til it’s all coated. Throw it in the oven on a cookie sheet for 30 minutes at 400 degrees, stirring it up halfway through so the florets cook evenly. During the last 5 or so minutes the cauliflower is cooking, heat up some marinara (or other kind of tomato sauce) in a saucepan and get out some parmesan cheese. Once the cauliflower is done cooking and the marinara is hot, pour the two together in a big bowl and sprinkle cheese. Stir it up so the cauliflower is all covered in the sauce, add some salt, and eat! Since I’ve cut out carbs pretty much completely, this dish has been a go-to for those nights I’m craving pasta or anything Italian! If you make it, let me know how it goes/if you like it! I have to try this recipe, I am cutting carbs too but I do need more snack options. Will try it for sure. Love this casual look. Ooooo I’ll have to try your cauliflower pasta! 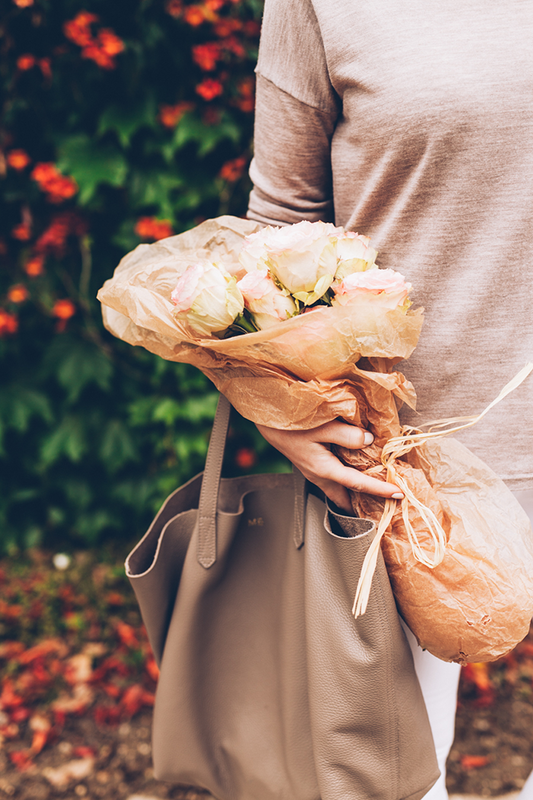 I also love picking up flowers at the grocery store; it makes the trip more enjoyable. Beautiful look, and I love your hair here! Love this easy, chic look! 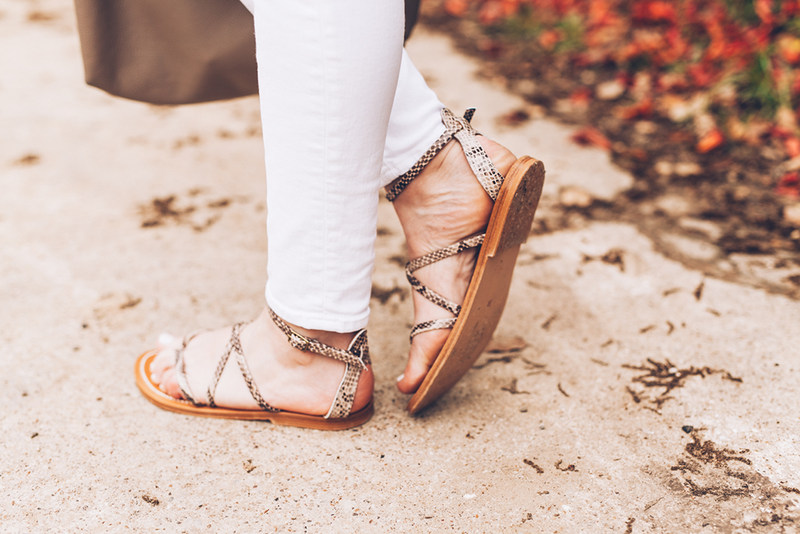 Those flat sandals are great! So lovely photographs. 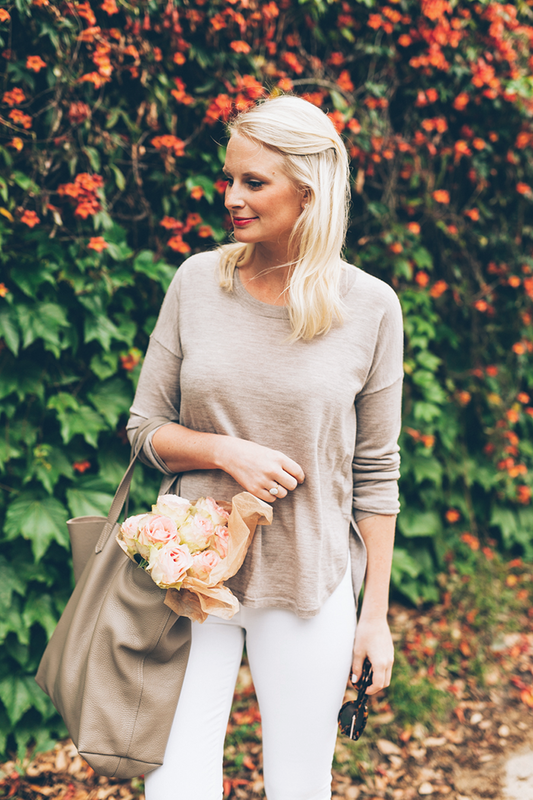 Your outfit is so effortless, love the neutrals! Absolutely love these photos and the outfit on you! Will have to give that recipe a try – sounds delish, plus healthy! Thanks for sharing! these photos are seriously gorgeous!!! While I am always down to go out for a yummy meal, I totally agree about how nice it can be to just have a wonderful meal at home. 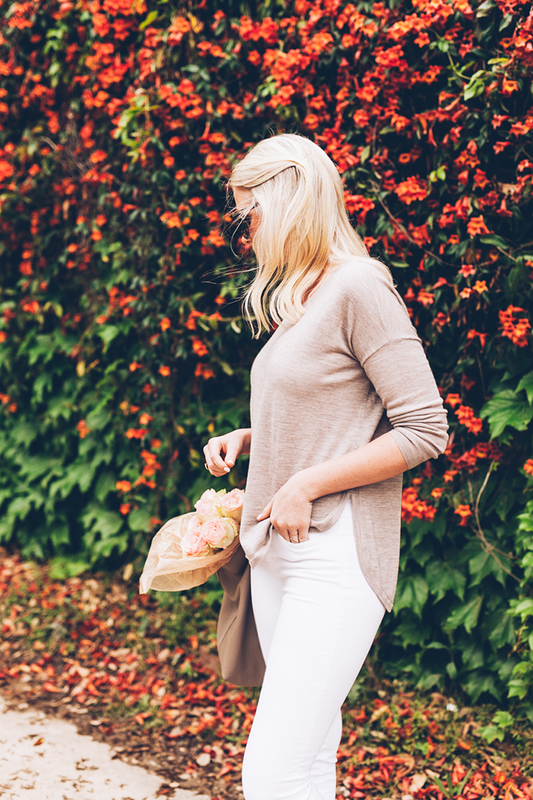 I am in love with this outfit, tan + white is my favorite color combo. 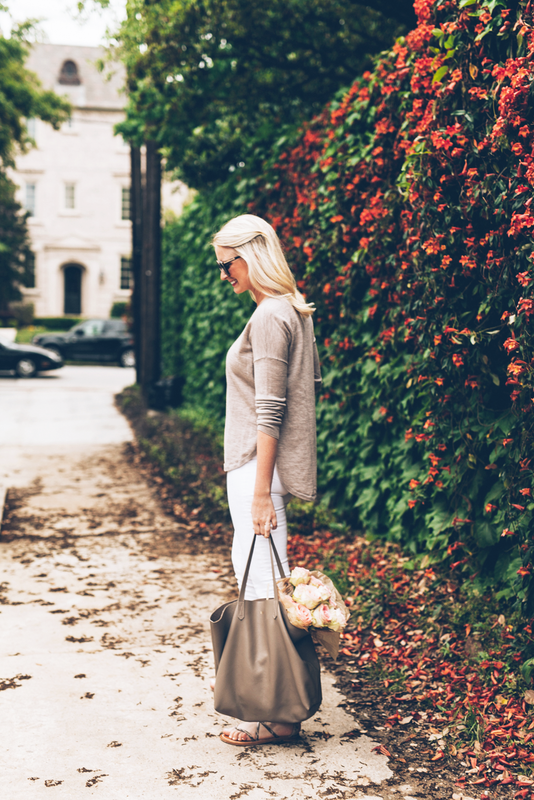 I have that exact same Cuyana bag, such a great basic! Have you been happy with those Karen Walker sunglasses? I have been eyeing them lately because I have been looking for a new pair of large glasses..but I am just not sure. Yes I LOVE them! They’ve been a go-to since I bought them. They’re the biggest frames I have, and I adore them! LOVE love the filter on these photos!! Is this a lightroom program!? Gorgeous outfit too – the colors are so perfect and pretty. 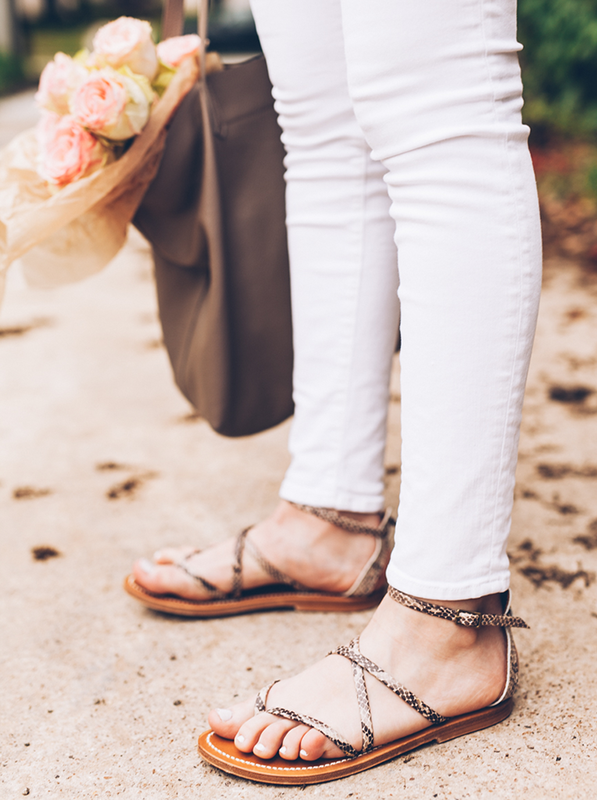 Such a sweet, simple, spring-y look. Love it! I love the atmosphere in these photos! gorgeous. I’m always killing plants too. It’s kind of sad. 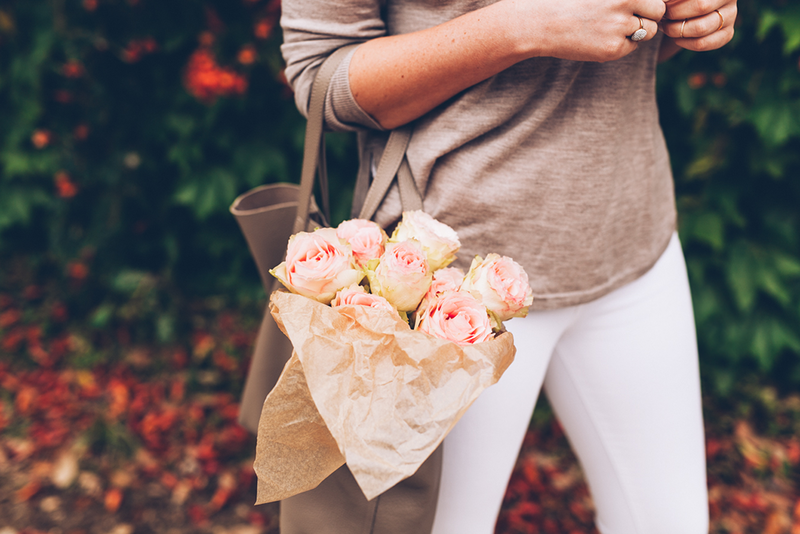 Love that tote, perfect for weekend errands. I am making this pasta tomorrow! Looks so amazing. And visually, this is my favorite post of yours to date. These photos are gorgeous and you look so happy! I love this simple but chic outfit. Those sunglasses are amazing! That recipe idea sounds really good. Thanks! I’m so glad you liked the Cauliflower dish!! I’ll definitely have to try this kale recipe. Sounds delish and so healthy! My weight has fluctuated a lot but for a whole bunch of other reasons that are too personal to share here haha. I love your honesty. I personally believe in focusing more on healthy, balanced eating and exercise as opposed to focusing on weight loss or getting to a certain number. And I try not to say that foods are “good or bad” but try to eat mostly healthy with the occasional treat. Those recipes look so yummy- I must try the cauliflower one. I make the spaghetti squash similar but add mushroom and skim shredded mozzarella on top- yum! Whoops, I posted here instead of your original post, oh well!